The cottage is located on a quiet lane and it is the perfect destination and property for a relaxing country break. The property is over 300 years old and was converted from the village “wash-house” many years ago. The cottage has recently been modernised to a very high standard, whist maintaining much of it’s charm and character. It offers spacious, luxury (“5 star”) sleeping accommodations for two people (super king bed or two singles, please specify preference on booking), plenty of space in the main bedroom for a young child (travel crib and high chair available on request) and there is a high quality sofa-bed available in the living room for extra guests/children (extra bedding available on request). The large bedroom features the original beams. There is a clear view of the White Horse of Kilburn from one of the bedroom windows. The property features a modern, spacious very well equipped, kitchen/dining area for four people. Facilities include: full/size washer/dryer, fridge/freezer, oven/grill, 4-hob induction top, dishwasher, coffee maker, kettle, toaster and plenty of high quality kitchen equipment, stoneware crockery and solid oak furniture. We provide tea, coffee and many kitchen essentials. The lounge/living room is full of character and features a solid fuel/wood burner connected to a central heating and hot water system (we provide the wood/solid fuel - you keep the fire burning!). This room has all the original beams visible. The solid fuel heating system is supplemented by modern electric radiators and an immersion heater for hot water. The full bathroom has a high power electric shower providing instant hot water for the shower/full bath. The living room includes a high quality full-HD TV/Radio, FreeSat, Catch-up TV, DVD player, Bose music player and BT Infinity Broadband. Guests have the use of the whole two-story property. It is an end terrace with a shared wall which is separated from the bedroom and lounge by a staircase. There is a small outdoor seating area in front of the property. Pets will be considered; we just ask that they kindly stay in the large pet-friendly kitchen area (we provide a pet-gate). This is a non-smoking property. The property comes with a dedicated parking area and has secure storage for several bikes. It is on a very quiet lane, only about 100 yards from the pub and village square. We would love for you to come and spend a few days in Kilburn and enjoy some great Yorkshire Hospitality. We can provide you with plenty of information on a range of activities, walks and other excursions. We live in the village and can help you with any special requests or needs. We will always try to meet and greet you. If we cannot meet you we will arrange for our Assisting Manager, Linda, to meet you. In exceptional circumstances, such as a very late arrival, we can leave a key in a lock-box inside the porch. We have an arrangement whereby you can pre-book (the evening before) a full English Breakfast at the Forresters Arms (£7.50/person). The Forresters Arms also has a full lunch and dinner menu available. During the Spring/Summer season. the Mouseman Cafe is also open most of the day. Kilburn village is very popular with walkers, cyclists and pilots wanting to try their hand at gliding at the Yorkshire Gliding Club, which is close by. The village of Kilburn features many beautiful cottages, the White Horse (large hillside figure), the Mouseman Visitor Centre, the historic church of St. Mary’s and the very popular Forresters Arms Pub. 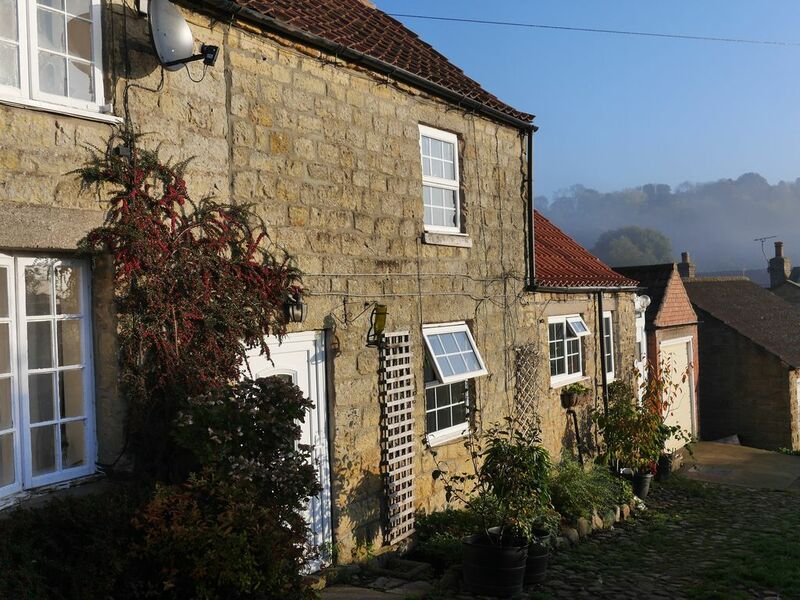 The property is very well located for touring both the Yorkshire Dales and the North York Moors, plus the city of York, Harrogate, Ripon, Knaresborough etc. A car is strongly recommended, although many beautiful and historic places can be accessed by walking/cycling. Should you want to visit, and can get to Thirsk by train or bus, for a reasonable fee we can organise a pick-up and transport to Kilburn. This takes about 15 minutes (7 miles). Thirsk has it's own charm, being the location for the Herriot Museum (All Creatures Great and Small) and was frequently mentioned as the local market town in Downton Abbey. The property is very safe and secure with security lighting and a lock-box for emergency key storage. There is a lot more local information and user instructions for the appliances in the leather-bound book at the end of the kitchen table. We are an international couple and this is our 2nd holiday home. We like to share this part of the world with others. It is quaint and convenient for us, and also for visitors/guests. There is a lot of activity to do, and things to see in the immediate area. Quaint and cozy, quiet, beautiful views. Clear skies for star gazing; countryside for exploring. Fresh air. Historic city (York) full of things to explore. There is an 'emergency landline phone'. With our wifi, you can use your own mobile phone(s). From wood stove plus additional electric heats for rooms and water, when required. Basics such as: oils, sugar, flour, salt, pepper, spices, provided, plus coffee and tea (and flavored/herbal teas). Modern, newly renovated to a high standard. Details of many local golf courses provided. Arrangements can be made. It was a pleasure having you at Jasmine Cottage and to visit this area of the country. You got to the coast, and sounds like you enjoyed the Gliding Club, too. We love seeing the gliders come over Kilburn! Thanks for your kind words. It was a pleasure having you two and your doggy at the Cottage! You two made the most of being in this lovely countryside. You found lots of good walking trails. Hope to see you again. Cozy. Quite. Warm. All mod cons. Original oak beams adding character to the property. Beautiful property set in the quaint village of Kilburn. Spotlessly clean, comfy bed and settee. Great pub 5 minutes away. 10 minutes from Sutton Bank and the ‘finest view in England’.If you want a total escape from the hustle and bustle of life then this property is for you. Thanks for your kind words. Glad that you were able to tour around this area. You did find 'The Most Amazing View' In England. Pretty spectacular, heh. So pleased that you all enjoyed The Cottage! We appreciate your kind words, and makes hosting a pleasure. Wishing you all the best for 2019! We had a lovely time in this beautifully appointed cottage in the village of Kilburn in North Yorkshire. The highlight was the range of little extras that the owners had left for us...from shampoo, conditioner and bath oil to local honey, Christmas tea and coffee and a large supply of wood and coals for the fire. The most welcoming we have EVER experienced. The bed was a super duper king size and was very comfortable. We loved every aspect of the cottage, the village and the wider area. 10 out of 10. Thank you. We are so pleased that you two enjoyed your stay at The Cottage! We really appreciate you taking the time to let us know, and it makes our hosting worth doing. Glad that you came to this part of the county, and wishing you a great 2019! So happy to hear that you all (3) enjoyed your Christmas at Jasmine Cottage! Wishing you all the best for 2019. p.s. We are also very pleased to have such a good Pub in the village/we will let them know you enjoyed! York city (19 miles) full of history; Pickering (25 miles) has 'live' rail way, etc. Kilburn village is in the North York Moors National Park. Castle Howard (19 miles) is what the TV series Downton Abbey is written about. Famous James Herriott, country vet, lived in Thirsk (7 miles) and a market town.